I’ve done the Kilimanjaro Lemosho Route with Tusker two times now (2008 and 2011) and I have to admit that I love being on that mountain. In all honesty, I am not sure what it is that attracts me so. On both occasions the experience touched me inside. In 2011 I was able to do the trek with two good friends – which made the trek so wonderful. Crater camp was scrubbed due to severe weather in 2008 but 2011 more than made up for 2008. WOW! Few people are as fortunate as me to have been able to sleep in the crater of Kilimanjaro in such ideal conditions. I felt so close to everything. It’s not just the mountain but also the quality of service delivery that was evident on both climbs from Tusker. In 2008, I had Kombe, Urio, and Frank as the guides and I couldn’t believe it when Kombe and Urio were the guides in 2011! As well, the cook, camp co-ordinator, and a number of the porters were on both of my trips. Tusker has such good and professional people that I do want to say that the company should be careful not to tamper with its formula of safety, qualified leaders, guide to client ratio, and excellent accommodations and food on the mountain. For example, in 2011 at Karanga camp Kombe and Urio heard coughing at around midnight and they got out of their sleeping bags and tent to determine whether one of the Tusker clients had the cough. That impressed me. 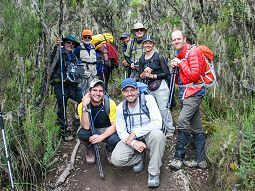 On summit day, one of the clients was struggling and Kombe strapped the client’s pack to his. This reinforced my belief that Tusker is a great company because its people really care. 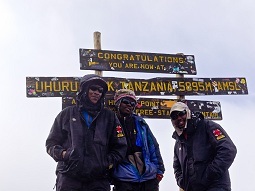 Three months ago I went back to the Tusker site and was excited to see the Kili 360 route. What a great idea! 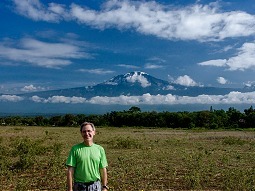 I would love to do that route and say goodbye to Kilimanjaro by the time I am in position to retire in 2016. While I can’t see me being able to do a trip like that until at least 2015, I did want to write and tell you that it is a great follow-up to Lemosho for any “alumnus”. Tusker’s other treks look very interesting as well but I have to say that Tanzania’s under my skin. Anyway, I hope that I will be able to sign up for Kili 360 without my wife threatening to divorce me 😉 at some point in the future. But if for some reason the unforeseeable happens, I do want to send along a sincere thank you to you and all of the other Tusker folks for making my dream come true – twice!